Unlock iPhone/iPad/iPod touch locked screen in different situations without passcode. 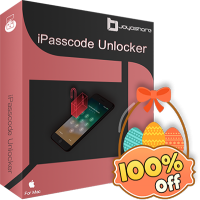 Joyoshare iPasscode Unlocker for Windows is a powerful tool that provides you with comprehensive solution to bypass iPhone, iPad or iPod touch passcode wherever possible, including typical passcode forgotten, accidental screen broken, many wrong password attempts, etc. By using this excellent utility, you can quickly factory reset iPhone or other iOS device without passcode in 3 simple steps: connect iDevice, download & check firmware package, remove screen lock. Most important of all, Joyoshare iPasscode Unlocker promises 100% safe guarantee from start to finish.